There is some minor assembly required with the mountain. This takes just a few seconds as they pieces easily fit together like a puzzle. Then just place the mountain in its spot and trains on their color coded track and you are ready to go. To move forward, each player draws a card during their turn. The card will tell you how many spaces to move on the board. Players continue to draw cards as they race to the mountain. When they get to the mountain and began to climb they chant "I think I can! I think I can!" 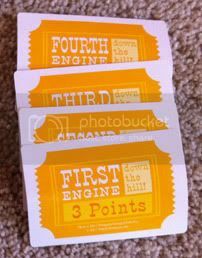 Once you get to the top of the mountain, you receive a ticket for being 1st, 2nd, 3rd or 4th. Each ticket has points listed on it. Then you release your train and let it zoom back down the mountain. This time chanting "I thought I could! I thought I could!" 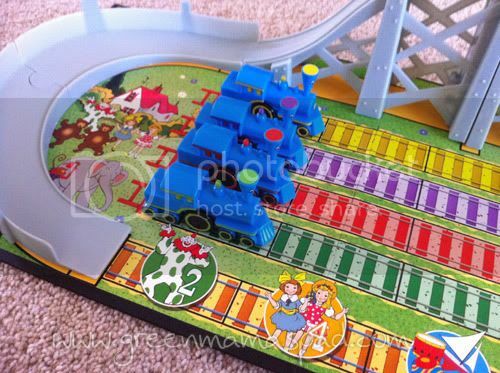 The space where your train lands on at the bottom of the mountain tells you how many points you will receive and you are awarded the corresponding token. Players add their ticket points and token points together and the player with the highest total points wins! When you are all done with the game, the pieces fit nicely back into the plastic tray which you slip back into the box for tidy storage. 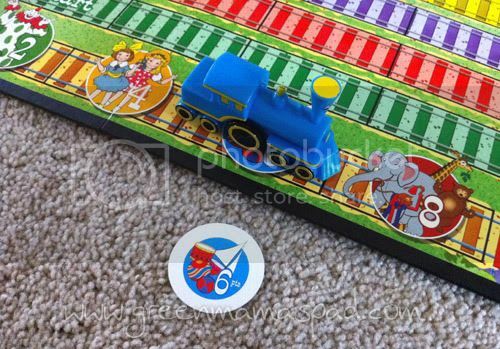 For ages 4 and up, this game is great for young children just learning how to play board games. The game play is simple and easy for them to understand and have fun with. My boys' favorite part was the zooming down the mountain and they repeated that multiple times once the game was done. Tales to Play games are available at Patch Products for $23.99 each. 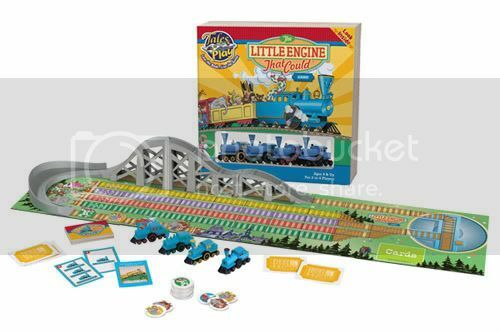 One winner will receive the Tales to Play: The Little Engine That Could Game reviewed here. Please use the Rafflecopter form below. My grandson loves everything "trains". The Little Engine That Could has always been a favorite for him. 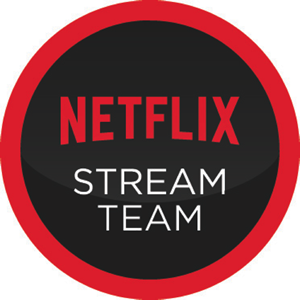 I think this is a great addition to that and a lot of fun. My grandson loves trains and read the book. My boys love trains, so I think they'd love this! My kids will love it! You have just given me a wonderful idea for one of their Christmas presents! 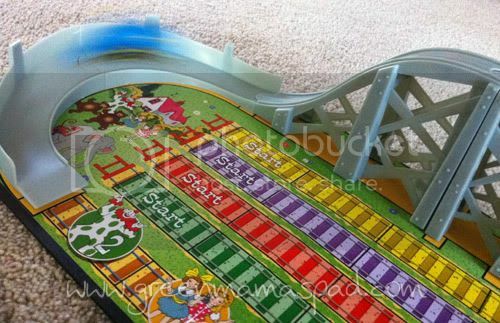 It looks fun because it's 3D and not just a flat board game. Looks fun because my kids love trains! They would get hours of enjoyment out of this! Thanks! my son loves to play with trains. 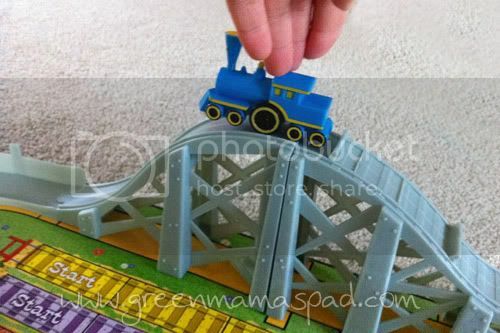 I think this looks fun because my son loves trains. This looks fun because both my 4 and 7 year old boys could play it. 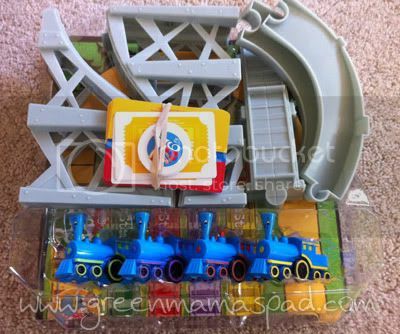 My son is train obsessed so I think this looks like amazing fun! 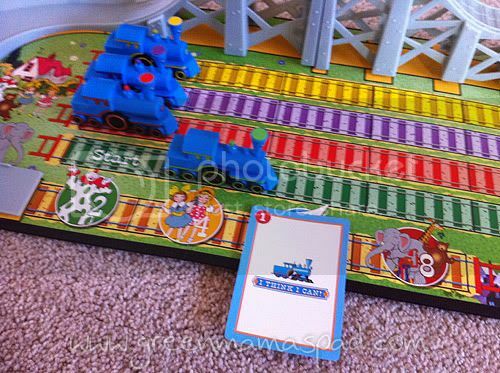 It looks like a fun game because it seems easy for little ones to play and it has trains, which I know my son loves! It's easy to understand how to play and the train going down the mountain sounds like fun. My granddaughter would have hours of fun playing it.